Kirstenbosch Botanical Gardens is often described as one of the best botanic gardens in the world. The garden sits on the slopes of beautiful Table Mountain and the unique climate here allows for very green, well watered gardens, nearly all year round. As such it doesn’t matter what time of year you visit, there’ll always be something to see. However, the prettiest flowers and the lovely show of colour that comes with them is best seen in the summer months. 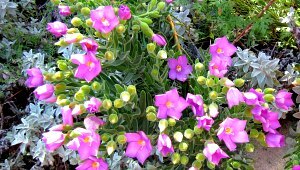 It’s the plants and flowers of the Cape that are the speciality here, but there’s lots more to see too. The origins of the botanical gardens at Kirstenbosch go back to 1913 when after years of traditional farming, the area was earmarked for a new botanic garden. At the time it was an overgrown and neglected farmstead, packed with weeds and foreign plants and a generous stock of pigs…so there was a lot of work to do. It’s amazing to see how the gardens look today when you think about those humble beginnings. Today, the gardens have a range of facilities to enjoy apart from the plants. There’s a lecture hall, conference centre, concert area and a state-of-the-art glass house. There are also three restaurants on site, each serving a range of different foods and refreshments. There are also a number of small retail outlets including a gift shop. Adult admission to Kirstenbosch is 45 Rand (2014 prices) and the gardens are open daily from 9am to 7pm in the summer months and 6pm in the winter months. If you don’t have a car, the Cape Town Hop-on, Hop-off Bus Tour blue route stops at Kirstenbosch but make sure you check when the last bus back to Cape Town is as they can be mid afternoon in the winter months.